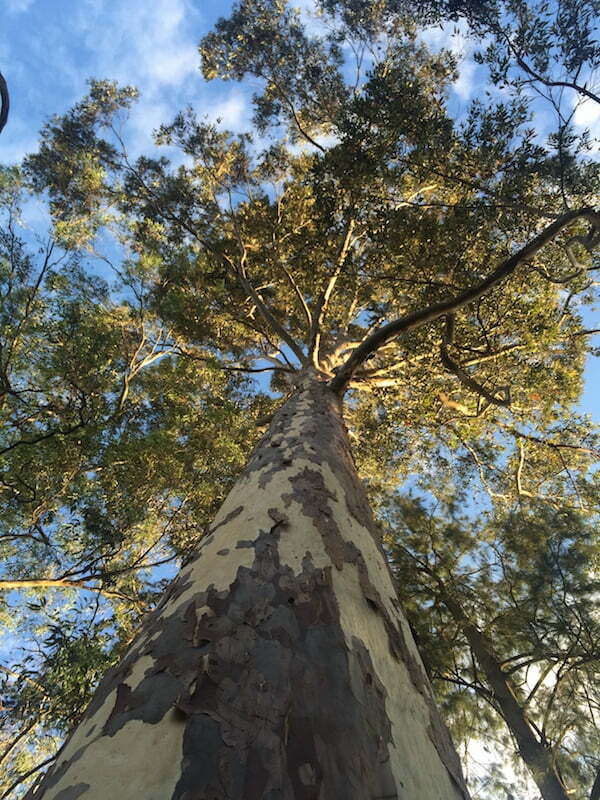 The large spotted gum tree in my little back yard sheds its bark each year and, after ten years of living with it, I finally learned a valuable life lesson from it. Over those years I’ve admired this beautiful tree. It is a strong and majestic tree. An Australian native, Corymbia maculata is endemic to the eastern states of Australia. A previous owner planted it and I’m not confident that he knew how big that little sapling would grow. Or even whether he knew of its future community minded capacity. At about 30 metres tall it is probably not the best choice for this location however it is a home or resting place for a community of birds, insects, bees and marsupials. I do really enjoy it. There are times when I’ve sat beneath it staring up at its crown mesmerised by the warm afternoon sunlight in its canopy. I’ve admired the soft patterned colourings of its trunk and branches. I’ve listened to the joyous cacophony of lorikeets chatting away as they feast on the nectar from the flowers. I’ve watched with delight when the tawny frogmouth owls perch in it. I’ve listened to the Pied Currawongs singing amongst its canopy. I’ve sat and watched in amazement and wonder at its ability to withstand strong winds with its branches swaying and twisting beyond what I think it could cope with, and yet it holds onto its branches not letting go of any of them during this moment of adversity. In fact there are actually many little lessons that I could take from just those things. However the occurrence that taught me on this occasion was the shedding of its bark. 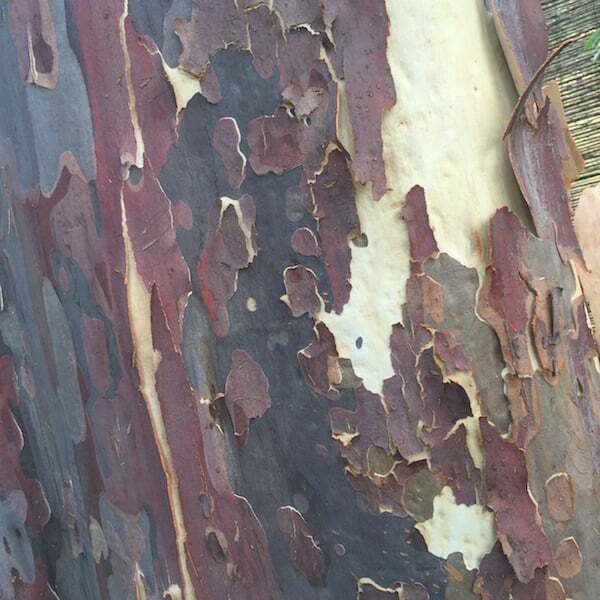 Apart from its strong stature, its bark is a large part of the tree’s beauty. It sheds its bark each year and its spotted appearance has soft hues of greys, pinks and creams. It sheds its bark at the same time each year. This is not a big issue. That is its natural cycle. It sheds in early summer in December. I’m usually not bothered by that, but I’m aware that sweeping up the bark from the paths is another job that needs to be done. So I do it, albeit with a little bit of resentment as another job that needs doing. However, this year my tree taught me a valuable life lesson that I’ll now embrace and look forward to each year. You see it sheds its bark in December, at the end of our calendar year, not that it knows that. Now, the past year has been a particularly big one for me, filled with some amazing highs and some challenging lows of life experiences. 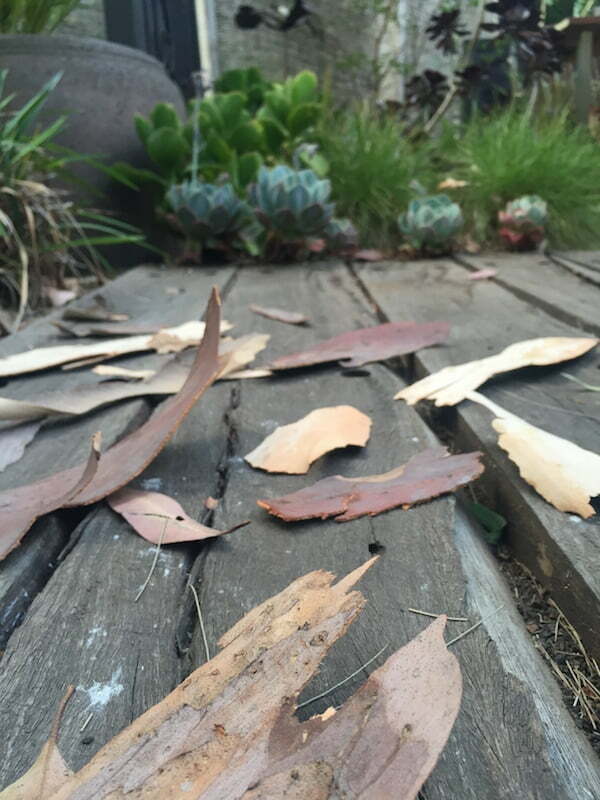 As I spent time in my garden reflecting on this I sat observing the fallen bark on my paths and it hit me. Here was the tree shedding all of its outer layer, all the good bark that protected it over the past year, as well as any that may have been damaged. And all of this was in preparation for its new year ahead. The tree just does the shedding processing naturally each year, knowing that it’s required for its survival, knowing that it’s healthy to shed the older layer. It’s at this point that I chuckle, thinking about us humans who scramble along continuously across the years thinking we’re great if we actually stop and reflect on our past year and do some planning for the year ahead, as opposed to doing it as our natural rhythm and cycle. So I learned that at the end of each year I will do my own version of shedding so that I can prepare myself for the year ahead. I will acknowledge all that the past year was, the highs and lows and everything in between. I will then choose to let go of them and release them in order for me to move into the new year with a new refreshed clean layer prepared for the year ahead. A short while after this nature-based life lesson I was sharing this epiphany with a good friend and he astutely and wisely added a deeper dimension to it. He suggested that as the year progresses I could write on the bark the happenings of the year, the joys, the struggles or the issues that I’ve experienced with the knowledge that at the end of the year they would be shed and drop off in a calm and quiet manner as the tree did its natural processes. A new year then begins … a fresh start. Gee, all that just from a tree. Aren’t trees great! That’s a great analogy. Another healing plant in the garden, emotional healing as well as physical healing in the garden. I can see the smile on your face from here! Thank Martin, yes smiling indeed. Happy gardener, happy life! Decay and renewal – it’s a wonderful thing! It is James, there is so much to appreciate and learn from it! 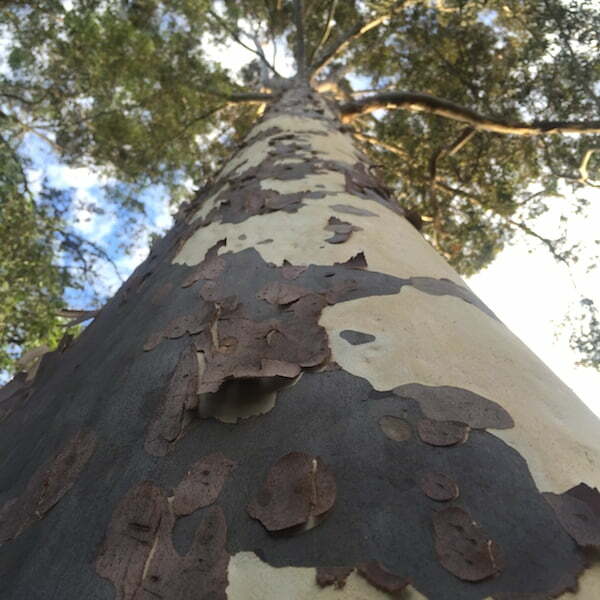 Each early summer when I see the newly emerging salmon-orange bark on our local Sydney red gums, I am bitten again by tree envy and wish I had room for just one more tree. New bark on smooth-barked gum trees is like nothing else and is, as you say, as strong a symbol of new life. Just as much as spring’s first flowers! Yes Catherine, the ever-present dilemma of a gardener with no more room for new plants, let alone ones that will grow big!! Perhaps in this situation you could just make time to have some early summer tree hugging moments of your local Sydney red gums on your morning walks … although perhaps really early in the morning just before the sun comes up in case people wonder what you’re doing!!! I will gather the bark from my huge, misplaced Eucalyptus with a new enlightenment and let my frustrations go, perhaps even forgive the clanking of the branches on my roof when the wind blows. That is excellent to hear Carolyn. Have fun gathering your bark with a refreshed and enlightened approach. What a lovely article Steven…love your take on this. Thanks Julia. It was certainly a nice epiphany moment for me. Yes a great article. I suggest every one needs to have a medium size gum tree, space permitting, in their back yard as I do, to enjoy the seasonal changes, shade and the exercise from sweeping up leaves and bark. Me too Jeff! 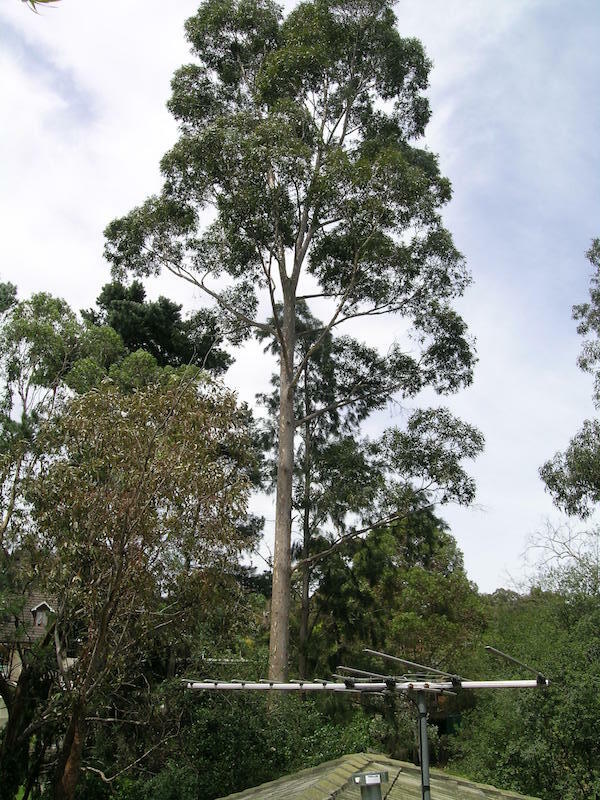 Naturally if space permits there are plenty of options for a medium sized gum tree, but even for those with smaller yards there are still options for smaller gum trees! Sadly we are losing the enjoyment of having backyard trees, either due to dwindling block sizes or increased house sizes, of from those who see trees as being messy, too much work to look after or don’t fit the clean architectural lines of “square bed landscaping”!! More trees I say! I love the time of the year when the eucalypts drop their bark! For many years I would take photos of several trees in the streets of North Carlton, to acknowledge the ‘secret shedding’ that happens while we go about our busy lives. We now have a eucalyptus mannifera in our front yard; probably too big for a suburban block in Reservoir, but definitely much loved. I really like your friends idea of writing on the bark, turning the yearly shedding into a very special ritual. A lovely article, Steven! Thanks Ruth. Yes I quite liked his idea too. I haven’t written anything on my tree yet but I will remember to grab the marker pen when I need to. Enjoy your Eucalyptus mannifera! Our tree shed its bark much later this year. In the past, they would be pretty much finished by Nov 11 whereas this year our tree had only just started shedding. Was your tree shedding on its usual schedule? That is interesting, perhaps it had something to do with the cooler Spring that we had here. Mine seems to be just a little later, usually early December is its main shedding time.